With this Offer, You’ll Never Have to Look for Another Workout EVER Again! You Already Have the Proven Finishers… But Do You Have the Right Workouts to Get the Fastest Results? If you want access to your very own library that allow you to use bodyweight one month, then conditioning workouts the next month, then meathead workouts the next month and even more… then you’re about to discover an amazing deal on 40 weeks of PROVEN metabolic workouts, plus MUCH, MUCH more to get insane results YEAR-ROUND. Who says you can’t lose fat and gain lean, chiseled muscle at the same time? With Meathead Freaks, you’ll do classic meathead workouts, but end them with a bang with intense finishers. Not only that, but you’ll also get a 4th day that is optional dedicated 100% to conditioning (including a wicked 20-10 circuit). Everyone is a meathead and you love meathead workouts. How about combining full meathead workouts with metabolic finishers? Imagine having to go through a ladder finisher after every single workout… that’s what you’ll discover inside this fast-paced 4-week system. Each workout ends with a ladder finisher grand finale. It’s one of my “darker” programs with advanced methods. But give it a full 4 weeks, and you’ll get shredded like a Super Hero. The magic behind this program is it’s flexibility. You can use these as off day conditioning workouts if you like to stay active 5-6 days a week or it’s a great program with a 2/day a week format to use when you’re really busy. This 4-week program is dedicated to conditioning. You’ll train like an athlete as you lose belly fat and improve your overall fitness. It’s the perfect combination of dumbbell moves, bodyweight exercises and more to be the perfect “Hybrid” workout program. 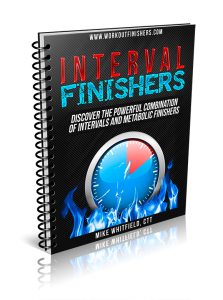 You’ll unlock your body’s FULL potential to burn fat while at rest by combining the power of intervals and finishers in one insane grand finale to boost your metabolism faster than ever. Every single finisher in this manual is 2 minutes. It’s the perfect “add-on” to burn a lot of calories in minimal time. It’s simple. When you sprint, you get lean, ripped and more athletic. Imagine having your LIFETIME library of full workouts, finishers and conditioning drills at your fingertips. And best of all, you’ll get this Ultimate Lifetime Workout and Finisher Package for 86% off the regular price. Here’s the deal – if you are not 100% satisfied for any reason with ANY of these programs, I’ll give you every single cent back. PLUS, you can KEEP every single one of these programs in case you change your mind. Yes, KEEP ALL of these programs and I’ll STILL give you every single penny back if you’re not satisfied for ANY reason. However, this is a ONE-TIME offer available on THIS PAGE only. Once you leave this page, you won’t see this offer anywhere else. No thanks. I understand that this is my only opportunity for this amazing offer and I’m okay with missing out, even at today’s HUGE discount. I understand that after declining this offer, that I will never be offered this system again at this price. I will pass on this forever.